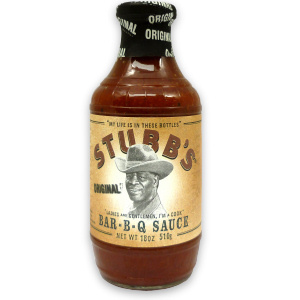 Considering Stubb's brand Bar-B-Q Sauces can be found in retail grocery stores all over the country, most of my readers are probably already familiar with the product. You probably all have your own opinions on the sauce as well. Rather than introduce you to a new sauce, I just take this opportunity to share my opinion on this well known sauce. Stubb's all natural Bar-B-Q Sauces are produced in Austin, Texas. Their Original recipe, like all Stubb's sauces, is packaged in stout 18 oz. bottles. It's got a great looking vintage label with a smiling Stubb (C.B. Stubbfield). In my opinion, Stubb's has the best packaging among the national brands. With a great look, quality ingredients and reasonable price tag, I really wanted to like Stubb's Original. Unfortunately, something about the flavor just rubs me the wrong way. The thick brown sauce is a tomato, vinegar mixture. Though the sauce contains both brown and white sugar, there is very little sweetness. There's a strong vinegar, pepper tang. Typically, I enjoy a tangy vinegar kick in tomato sauces, but Stubb's is missing the sweet, balancing element. The flavor just comes off as harsh and bitter. Texans will probably claim that I'm simply not man enough to handle their bold, tangy sauces. Perhaps they're right. However, I've sampled and reviewed other products of Texas and enjoyed them a great deal. In fact, one of my favorite sauce makers, SuckleBusters, hails from the Lone Star state. I would never discourage anyone for purchasing any product. Sauce makers work hard to create and distribute their products. I wish them all the best of luck. Unfortunately, I can't personally recommend Stubb's Original. 2 Response to "Stubbs Original BBQ Sauce"
I love the Stubbs BBQ sauce. Its the best i know! There is way too much sugar in everything these days. If it isn't sweet, people don't want it. No wonder the obesity rates have skyrocketed. The food industry has really done a number on us the last 40 years.